Order within 18 hours and 0 minute to receive your order by Friday 26th April. 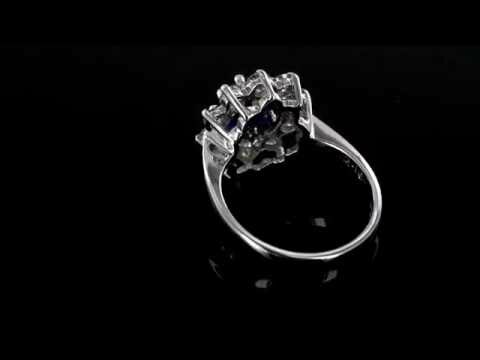 Rich with deep blue hues this stunning diamond and sapphire cluster ring is a truly unique piece. Very much like the one Prince William presented to the Duchess of Cambridge, this piece is certainly a popular choice for that very special day. Seamlessly crafted and set upon a lustrous 18 carat white gold band, the beautiful oval mixed cut sapphire makes this ring a truly elegant choice having been set and held in a cluster of sparkling brilliant-cut diamonds weighing in at over a full carat. Bold and beautiful and as the most durable gemstone on earth, this fantastic sapphire totals at a 2.01 carat, allowing you to appreciate its vivid blues and royal aura in a bigger and more beautiful size. Catching on to our desires, sapphires have wowed us back in 1981 with the famous Princess Diana's engagement ring and again in 2011 with Catherine Middleton - this ring is a timeless classic.